As followers of this blog know, getting a job in the archival field is something that we touch upon often, most notably in our From The Trenches series. However, to this point we have not had a post focused on getting an archives job. In my case, I have been hesitant to write such a post because I figured that people would say: thanks for the advice, Mr. Only-Had-A-Real-Job-For-Like-A-Year. However, my attitude changed last week. After reading a series of messages on the A&A listserv regarding the state of the job market, I asked the Twitter machine if others felt that the market was that bleak. Once again the archivists on Twitter did not disappoint and gave me some great insight and inspired this post. As way of disclaimer, I am not saying that the things discussed here are guaranteed to get you a job. I am also not trying to blow sunshine up anyone’s petticoat. I was lucky in that I had an archives job lined up right after grad school. But in my previous career I endured an unemployment period that lasted over a year. It sucked… hard. If you are currently going through such a period, I hope that hearing some successful stories helps. Grad School is Key, but not the School Part The job hunt should start from the first day of grad school. I don’t mean start looking the first day, but you should immediately start thinking about building a resume and carving an area of interest for yourself. As twitterer Jess M said: “I think we can make niches for ourselves.” School is great and you learn a lot. However, I found that the best way to carve those niches were the experiences I gained outside the classroom. Use the fact that you are going to grad school as a ticket into places that will help build your skills and allow you to meet people who will be helpful in your career. Four of the five NewArchivist regular contributors currently have jobs that are in, or connected to, places they had contact with while in school. In my case, I did an unpaid part-time internship between my first and second year at the organization where I am currently employed. Many of my classmates are currently placed where they did some sort of volunteering, internship, or part-time employment. If you want a job at a specific location or institution, then try your best to get some kind of experience there. You still have to be lucky in that a position will need to open at the right time, but being there to take advantage of that luck is half the battle. Volunteering Often the type of experiences outlined above can only come in the form of free labor, be it volunteering or unpaid internships. During the listserv discussion, the importance of volunteering was mentioned several times. It has also been written about on this blog by Sophie and D.S. On Twitter, Megan summed it up: “Best advice I can give is to throw yourself out there. Volunteer, be involved with prof organizations, go back to school, etc. I wish I did more of this when I first started. [F]our years ago, but I was shy, nervous, etc. Once I started to put myself out there, my job prospects seem to be going up.” My advice is make sure you get something tangible out of volunteering, whether it be employment contacts, specific skills, or even a measure of confidence. In lieu of money, “employers” should be willing to give you their time and offer things like advice and resume reviews. If they are not willing to commit to this up front, I would probably not be willing to give them my labor. The fact that unpaid experiences help in getting a job is, well, a fact something I am pretty sure of. However, I also think making unpaid experience a gateway to the profession is deeply troubling. Some of the comments on Sophie’s latest post summarize that view perfectly. The idea that we have to go to grad school and then serve a kind of apprenticeship is, in my opinion, outdated and elitist. Also, how can we say that we are concerned with diversifying our profession while at the same time saying mountains of educational debt and time served in non-professional positions are entry fees to a career? I dont have an answer to this paradox, but I do think that this will be up to our generation of professionals to solve. When we are in positions of power, will we continue to use volunteering as a litmus test? I hope we can come up with something better. 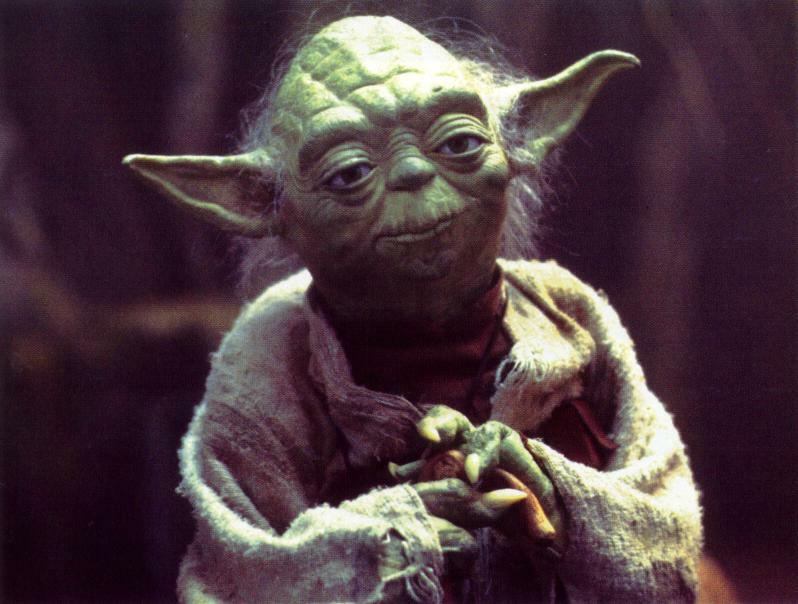 “Once you start down the dark path, forever will it dominate your destiny” While Yoda was talking about the ultimate battle between good and evil here, this advice can also be applied to career direction. Some on the listserv suggested diversifying your skills with things like records management to make yourself marketable in areas other than archives. Based on my limited experiences and talking to seasoned professionals, I strongly disagree with that advice. It is one thing if you genuinely want to explore different paths like librarianship or records management. But if you goal is ultimately getting a job in the archival field, it is hard to argue that a job in another area will give you skills to compete for those archival jobs, now or in the future. Yes, it would be employment and I know that we all have to do what we have to do to pay our bills. However, didn’t we all choose this low paying, low glamor career so we can follow our passion? I am not saying only take a perfect job out of school, none of us have that opportunity. But be certain that the job you do take will help get you where you want to go. If you want to be a records manager, be one, if you want to be a librarian, be one, and if you want to be an archivist, than be an archivist. Otherwise you may wake up one day shouting nooooooooooooooo! Never Forget This might be a little out of place in this post, but I feel the need to say it anyway. As we move along in our profession, lets never forget what it is like to look for employment. So far my job hunting experiences in the archives field have been very good, but I have heard stories. In my previous period of unemployment, I was always shocked at how soon people forgot what it was like to look for a job. The stress, the limbo, the effort involved. I cringe when I hear people give weird or silly reasons to not consider an applicant. 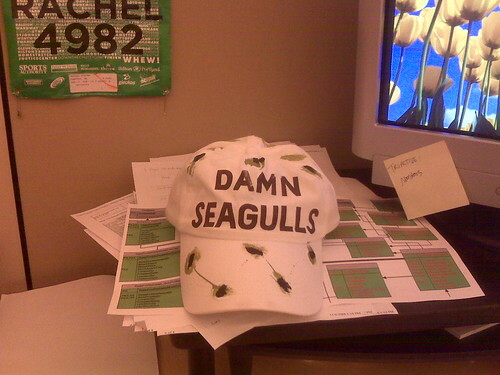 I am not saying consider people for employment that show up to interviews wearing a damn seagulls hat. I am asking that we remember that each application and resume represents a person that can add to our profession and deserves respect. And when we see others in our profession doing otherwise, we call them out. This is just the tip of this iceberg and we at NewArchivist will be posting a lot more on this topic in the future. If you have other tips or opinions, please leave them in the comments or let me know and we would gladly welcome a guest post. You also should checkout the blog That elusive archives job, which focuses on getting an archives job. And most importantly, if you are currently looking, know that there are a lot of people in your corner, and good luck! I totally agree with starting to build your resume whilst studying. Doing voluntary work really helped me figure out the type of archive I wanted to work in and the type of archival material that I most enjoyed working with. I really enjoyed doing voluntary work, but I’m sure this was because my current job at the time, working in a wine shop, was getting me down (although it had its perks!). I can’t imagine if I’d had to do voluntary work after graduating but I know this is the case for many people, and it may well be the case again for me one day given that so many of the jobs in the UK Archive sector are fixed term contracts (is it the same in the US?). However I hope that the variety of voluntary work I did prior to, and during my course, coupled with my professional experience over the past four years, will mean voluntary work is a thing of the past! “When we are in positions of power, will we continue to use volunteering as a litmus test? I hope we can come up with something better.” Working in the University sector with continued cuts to services I can’t imagine that something better will come up. Voluntary work, internships, outside-archive activities such as blogging, conference attendances etc. do show someone’s committment to the profession. I’m not saying I agree with it, just that I can’t see things changing. However I know from my experiences of working in universities that the efforts of volunteers are often rewarded with paid work whenever it is available. It’s interesting, though not particularly encouraging, to see that the dependence on voluntary work for experience/employment is not particular to the UK Archives sector! On a complete side-note, I had an internship at a museum/archives while working in the wine department of a retail store. Another similarity between the US and UK must be the profusion of wine-knowledgeable unemployed archivists! Bravo on all points. And I’m definitely with you on the antipathy/hesitancy/uncertainty as to the value of volunteering. If it’s going to allow you to network with people who really are connected, provide your resume with deliverables, go for it. But I don’t agree with some in the field that volunteering is the way to enter the profession. I even dislike the trend that’s growing that forces so many of our recent graduates into grant-funded temp positions. If you’re still exploring what you want to do, that’s fine. But seems so unfair to me. That’s what internships are for, not post-degree work. How does anybody pay off student loans if they’re forced into non-paying jobs or stuck with jobs that either come to a sudden halt or that you spend half of the term having to job-search again so you’ll be employed when the grant ends? Every time I hear people talk about sustainability when applying for massive federal funds to hire people on term projects, I just get the shivers. Sustainable in that the collections are described, but not sustainable for professional development, for careers, for the profession. Sure the hires get experience processing, describing, maybe digitizing, but what about their long-term development? Experience managing? Grant-writing? Policy-crafting? All those things that will allow them to move onward and upward in their careers? That’s a grant project I want to see. I think I’ll be waiting for a while. Keep fighting the good fight, Lance. Thanks for the agreement! I almost brought up terminal grant funded appointments in the original post. The job I currently have is both time limited and grant funded and I see it a lot like the volunteering. In an ideal world, we would all get the permanent employment we deserve. I will say these those positions are a great way to try something on for size or as a way to get some very specific and relevant training to boost your real-world credentials. I had not thought of sustainability the way you presented it here and think that is an outstanding point. Why are funders and archives putting the emphasis on the sustainability of programs and not people (and that is not a rhetorical question, I seriously don’t know)? I’ll keep fighting as long as you keep reading and bring up these great points! Is it in fact fact? That is, have you been able to locate research studies that find that unpaid experience leads to a job in a X% of cases? Since we’re asked to accept that our unpaid labor equals future rewards, it would be great to see a measure of the likelihood that our freely-given time will result in the desired benefit of a job. If you do go looking for a stat that gives some objective weight to our own anecdotal experiences, distinguish between “networking equals jobs” from “unpaid internship equals jobs”. I *have* seen good research that a high percentage of job-seekers get employment through their networks. I’m questioning whether you necessarily need to build these networks through free labor. A questioner, I like that! Your point is very well taken and I probably should not throw around the word fact without actually knowing if it is indeed a fact (I have adjusted the language in the post accordingly). The statement that you bring up is based solely in anecdotal evidence. Some of that anecdotal evidence is quite personal, as I know I would not have been hired for my current position if I had not first done an internship. I think you could postulate a pretty strong thesis around the fact that working in the field greatly improves your chances of being hired to a professional position. While I am certainly not saying that unpaid is better than paid, it might be the only option. Especially if you are targeting a specific institution or specialization within the field. I think you raise an interesting point on networking. I could certainly see other forms of networking take the place of uncompensated work in some instances. I am sure that you can tell by my post that I am not comfortable with the prominence of unpaid work has in our profession and welcome any ideas that may help.